Earlier on Monday, a puppy named Francesca was found wandering on the streets in Jefferson County, Alabama. 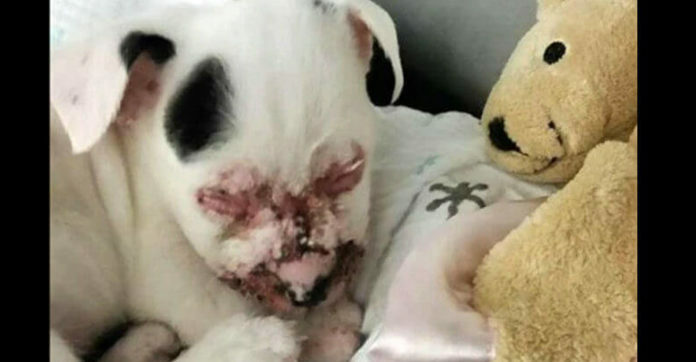 She had been abandoned and had suffered from a chronic infection on her body. Thankfully, a good Samaritan rescued her and brought her to the Greater Birmingham Humane Society for recovery. She suffered from acute dermatitis, which was a bacterial infection that might have been transmitted from fleas and septic wounds. Although no one is sure on what happened to her, it was clear that she might have been severely neglected. Francesca is currently under the care of the veterinarians at the Humane Society, who estimated that she will need more than a month to recover.